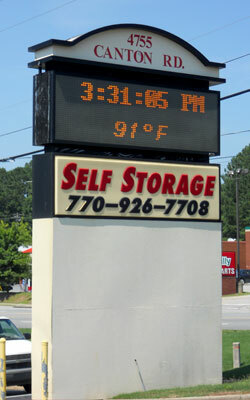 Looking for self storage in Marietta, GA? Canton Road Self Storage has everything you need to store your items safely and securely. Our facility has digital security cameras and coded gate access. We offer climate-controlled storage to protect your items from the elements as well. Behind all this technology are friendly associates who deliver excellent customer service. Our goal is to provide you with the best self storage experience possible. Canton Road Self Storage services the Marietta area, and other surrounding communities like East Cobb, Woodstock, Kennesaw, and Acworth. We offer units from 5’X5’ to 10’X30’ and are open 7 days a week for your convenience. Whether you are storing personal items from your home, or extra inventory for your business, we have a storage solution that will satisfy your logistical and financial needs. Call us to reserve a unit today or drop by for a personal tour. We know that once you see our facility, there will be no questioning that Canton Road Self Storage offers the best self storage units in the area. We are a Uhaul Neighborhood Dealer and sell a wide selection of boxes, packing, and moving supplies. We have trucks to rent and can make a reservation for your upcoming move, be it local or one way. Call for details.